صالحپور, شوبو, جنوبی, مهدی, اکسمان, کریستینا, احمدزاده, مسعود, خانعلی, مجید. (1396). بررسی خواص زیست تخریب پذیری و مکانیکی پلی وینیل الکل تقویت شده با نانو الیاف سلولزی. مجله صنایع چوب و کاغذ ایران, 8(4), 497-508. شوبو صالحپور; مهدی جنوبی; کریستینا اکسمان; مسعود احمدزاده; مجید خانعلی. "بررسی خواص زیست تخریب پذیری و مکانیکی پلی وینیل الکل تقویت شده با نانو الیاف سلولزی". مجله صنایع چوب و کاغذ ایران, 8, 4, 1396, 497-508. صالحپور, شوبو, جنوبی, مهدی, اکسمان, کریستینا, احمدزاده, مسعود, خانعلی, مجید. (1396). 'بررسی خواص زیست تخریب پذیری و مکانیکی پلی وینیل الکل تقویت شده با نانو الیاف سلولزی', مجله صنایع چوب و کاغذ ایران, 8(4), pp. 497-508. صالحپور, شوبو, جنوبی, مهدی, اکسمان, کریستینا, احمدزاده, مسعود, خانعلی, مجید. بررسی خواص زیست تخریب پذیری و مکانیکی پلی وینیل الکل تقویت شده با نانو الیاف سلولزی. مجله صنایع چوب و کاغذ ایران, 1396; 8(4): 497-508. هدف از این مطالعه، تقویت خواص پلی وینیل الکل با استفاده از نانو الیاف سلولزی می‌باشد. به منظور بهبود سازگاری و قابلیت اختلاط نانو الیاف سلولزی با پلیمر، از روش خشک کردن انجمادی استفاده شد. فیلم‌های نانو چندسازه برپایه پلی وینیل الکل با مقادیر 5، 10، 20 و 30 درصد وزنی نانو الیاف سلولزی با استفاده از فریز درایر تهیه شدند و اثرات نانو الیاف سلولزی بر خصوصیات مکانیکی، دینامیکی-مکانیکی، جذب آب، بازندارگی و زیست تخریب‌پذیری نانو چند سازه‌ها مورد بررسی قرار گرفت. استحکام کششی و مدول الاستیسیته فیلم PVA به طور قابل توجهی با افزودن نانو الیاف سلولزی بهبود یافت. در این رابطه نانو چندسازه تهیه شده از 10 درصد نانو الیاف سلولزی، دارای بیشترین مقاومت کششی و مدول الاستیسیته بودند. همچنین نتایج نشان داد، مدول ذخیره نانو چندسازه‌ها با افزودن نانو الیاف سلولزی به درون ماتریس پلیمری به طور قابل ملاحظه ای بهبود یافت. با افزایش مقدار نانو الیاف سلولزی از صفر به 30 درصد نفوذپذیری به بخارآب از 31/7 به g/m.h.pa×107-×1/2 کاهش یافت. همچنین حضور نانو الیاف سلولزی موجب بهبود خاصیت جذب آب پلی وینیل الکل شد. کاهش وزن فیلم‌های پلی وینیل الکل با افزودن 30 درصد نانو الیاف سلولزی پس از 90 روز قرار گرفتن در محیط خاک 60 درصد افزایش یافت. Mir Mohamad Sadeghi, G. and Miri, A., 2014. Compostable Polymers Materials, first Ed., Amirkabir University Publications, Tehran, 326 p. (In Persian). Ammala, A., Bateman, S., Dean, K., Petinakis, E., Petinakis, E., Sangwan, P., Wong, S.,Yuan, Q., Yu, L., Patrick, C.; Leong, K.H., 2010. An overview of degradable and biodegradable polyolefins. Progress in Polymer Science, 36(8), 1015–1049. Larry, R., Krupp, W. and Jewell, J., 1992. Biodegradability of modified plastic films in controlled biological environments. Environmental Science and Technology, 26: 193-198. Chandra, R. and Rustgi, R., 1998. Biodegradable polymers. Progress Polymer Science, 23(7):1273–1335. Silverio, H. A., Flauzino Neto, W. P. and Pasquini, D., 2013. Effect of Incorporating Cellulose Nanocrystals from Corncob on the Tensile, Thermal and Barrier Properties of Poly(Vinyl Alcohol) Nanocomposites. Journal of Nanomaterials,2013: 1-9. Roohani, M., Kord, B., Motie, N. and Sharari, M., 2014. Biodegradation behaviors off cellullose nanocrystals-PVA nanocomposites. 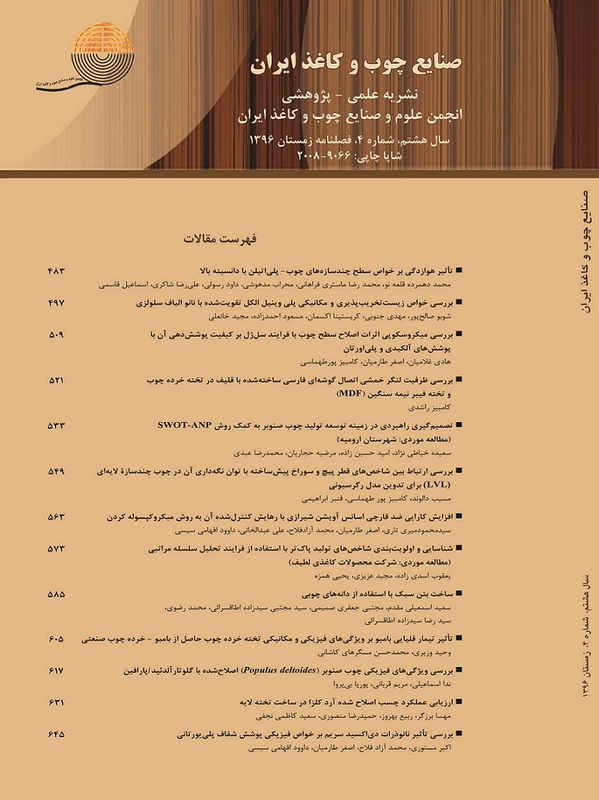 Iranian Journal of Wood and Paper Industries, 5(2): 1-13. (In Persian). Frone, A. N., Panaitescu, D. M., Spataru, D. D., Radovici, C., Trusca, R. and Somoghi, R., 2011. Preparation and characterization of PVA composites with cellulose nanofiers obtained by ultrasonication. Bio Resources, 6(1): 487–512. Rescignano, N., Fortunati, E., Montesano, S., Emiliani, C., Kenny, J.M., Martino, S. and Armentano, I., 2014. PVA bio-nanocomposites: A new take-off using cellulose nanocrystals and PLGA nanoparticles. Carbohydrate Polymers, 99: 47–58. Sorrentino, A., Gorrasi, G. and Vittoria, V., 2007. Potential Perspectives of Bio-nanocomposites for Food Packaging Applications. Trends in Food Science and Technology, 18:84-95. Adeosun, S. O., Lawal, G. I., Balogun,S. A. and Akpan, E. I., 2012. Review of green polymer nanocomposites. Journal of Minerals and Materials Characterization and Engineering, 11(4): 385-416. Cunha, A.G., and Gandini, A., 2010. Turning Polysaccharides into Hydrophobic Materials: A Critical Review. Part 1. Cellulose, 17: 875-889. Kalia, S., Dufresne, A., Cherian, B.M., Kaith, B. S., Averous, L., Njuguna, J. and Nassiopoulos, E., 2011. Cellulose-based bio-and nanocomposites: A review. International Journal of Polymer Science, 10: 1-35. Jonoobi, M., Jalaluddin, H., Mathew, A. P. and Oksman, K., 2010. Mechanical properties of cellulose nanofiber (CNF) reinforced polylactic acid (PLA) prepared by twin-screw extrusion. Composites Science and Technology, 70:1742–1747. Abdelwahed, W., Degobert, G., Stainmesse, S. and Fessi, H., 2006. Freeze-drying of nanoparticles: Formulation, process and storage considerations. Advanced Drug Delivery, 58: 1688–1713. ASTM, Standard Test Methods for Tensile Properties of Thin .Plastic Sheeting, D882-91. Annual Book of ASTM, Philadelphia, PA: American Society for Testing and Materials, 1996ASTM, D882-91. Angles, M.N. and Dufresne A., 2000. Plasticized starch/tunic in whiskers nanocomposites. Structural analysis. Macromolecules, 33:8344-8353. ASTM. Standard Test Methods for Water Vapor Transmission of Material, E96-95. Annual Book of ASTM, Philadelphia, PA. American Society for Testing and Materials, 1995. ASTM D5988-03, Standard Test Method for determining aerobic biodegradation in soil of plastic materials or residual plastic materials after composting, Annual book of ASTM: American Society for Testing and Materials, Philadelphia, PA, 2003. Lani, N. S., Ngadi, N., Johari, A. and M. Jusoh., 2014. Isolation, Characterization, and application of nanocellulose from oil Palm empty fruit bunch fiber as nanocomposites. Journal of Nanomaterials. Macromolecular Research, 24(1):51-59. Hietala, M., Mathew, A. P. and Oksman, K., 2013. Bionanocomposites of thermoplastic starch and cellulose nanofibers manufactured using twin-screw extrusion. European Polymer Journal, 49: 950–956. Paralikar, Sh., Simonsen, J. and Lombardi, J., 2008. Polyvinyl alcohol/cellulose nanocrystal barrier membranes. Journal of Membrane Science, 320 (1):248-258.